The DNA of Diphlu River Lodge in Kaziranga National Park, is all about experiential travel. And Nature had certainly laid out the gamut of experiences for their Royal Highnesses' stay with us on those two momentous nights. The Duke and Duchess of Cambridge had Assam's tumultuous thunderstorm greeting them as they neared Diphlu River Lodge on 16th April, 2016. But by the time they alighted, the Rain Gods were appeased. They certainly received a most auspicious Assamese welcome! The next evening, the royal couple had a firsthand experience of a 7.0 Richter scale earthquake, which got them out of their cottage in a hurry. They shared a laugh with their entourage who rushed down from the Machaan to be with them and this excitement added to the world's headlines the next day. Their first evening with us at Diphlu River Lodge also coincided with the first day of the Assamese New Year. This is ushered in by Assam's most favourite harvest festival of Rongali or Bohag Bihu. We invited local Santhal (a tea community) dancers to perform their distinctive folk dance, which was followed by a performance by local Bihu dancers. The men started off with their gogona (bamboo musical implement) and the pepa (a trumpet made of buffalo horn), with the gamosa (a handwoven white and red cloth) tied around their heads and waists, rendering the Assamese ballads of love in full-throated unison to the accompaniment of the khols (drums fashioned from gourds). The graceful women dancers followed, resplendent in the Muga mekhela Sadors (a two-piece saree in golden silk, a traditional attire of Assam) with kopou orchids (unique to Assam) tucked in their hair. The Bihu folk dance with its infectious gaiety had everyone foot tapping and clapping to the music. The other guests that evening were local villagers whom we had invited to meet the Royal Highnesses. The Duke sportingly tried to play the gogona himself, which won him the gift of this humble musical implement from the Lodge Manager. The Duchess's gesture of taking a group photograph with the Santhal dancers was heartwarming. Princess Kate had noticed that this group was sitting quietly on the ground, neglected with the media buzz around the Assamese Bihu folk dancers. Being offered the group photograph by the Princess herself spoke volumes about her and left the group filled with simple happiness. The Duke and Duchess came across as such a warm and down-to-earth couple with a ready smile for everyone which certainly won them everyone's hearts. They would stroll hand in hand through the grounds and along the river bank, enjoying each other's company and the tranquility of the Lodge. Diphlu River Lodge too was in her lush-green April finery. And in the pavilion, amidst the paddy fields, was our flautist whose soulful renderings of the ballads of Krishna pulled at one's heartstrings . 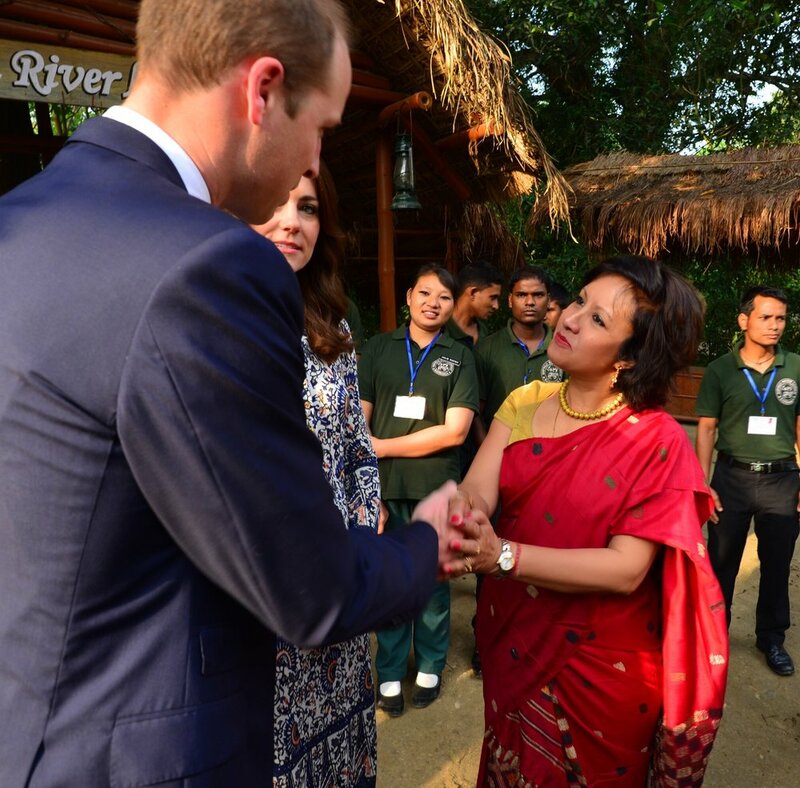 The visit of their Royal Highnesses was a great service to Assam in raising the world's consciousness about Kaziranga National Park. Their visit has given Kaziranga its rightful place in the sun as an incredible bio-diversity hotspot, one of India's only five Natural Heritage sites with the world's largest concentration of one-horned rhinoceroses and the world's largest density of tigers per sq km. As for the little 3-year-old boy who kicked at the royal feet on the night of the Bihu dances, much to the mortification of his father and to the amused delight of the Royal couple, he too can look back at his little footnote in history and have a story to tell his grandchild some day! Diphlu River Lodge is immensely proud to have been adjudged as the 2nd Best Wildlife Resort in India by Lonely Planet magazine, 2013.